You may wish to introduce reeds to your bagpipe one at a time and play for a while before installing subsequent reeds. This is not essential, but it will allow you to compare their performance and balance with that of the reeds you are currently playing and match to them if required. Without adjusting the position of the rubber bridle or the tuning screw (see diagram), insert the Ezeedrone reed into the reed seat of your drone. If required, add some waxed hemp to the end of the reed to ensure a secure fit. For drones with a particularly narrow diameter reed seat, it is perfectly acceptable to carefully remove the rubber sleeve from the end of the reed and apply waxed hemp to allow a secure fit in the drone. Test reed strength by blowing in the drone either by mouth or in the bagpipe. Do not attempt to blow the Ezeedrone reed outwith a drone as it is likely to cut out with little pressure. At this point you will be able to compare and match approximately to current drone settings if desired. If you feel the Ezeedrone reed is taking too much air (i.e. too strong to blow or double-tone too strong), move the rubber bridle in very gradual increments to shorten the tongue. 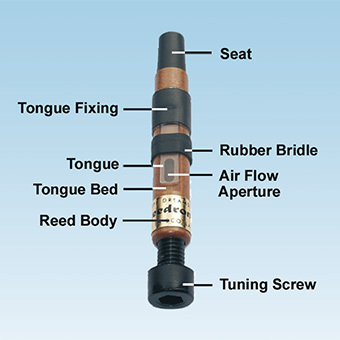 If the reed is taking too little air (i.e. stopping), move the rubber bridle in very gradual increments to lengthen the tongue. Note: A slight adjustment of the bridle will result in a significant variation in the air flow. When you are satisfied with the strength of the reed and the balance in relation to your other drones and your chanter you should now adjust the tuning screw at the end of the reed in order to set the height at which you wish your drone to tune. By turning the tuning screw anti-clockwise, this will flatten the reed resulting in your drone tuning lower. Conversely, by turning the tuning screw clockwise, this will sharpen the reed resulting in your drone tuning higher. As with conventional cane drone reeds, the position of the reed within the reed seat is also a factor which will affect the height at which your drone will tune. For further help we have prepared an instruction video.